At DougWebb.us & DougWebbJazz.com we collect information from users to help us understand who is using the site and why. We only use such data in the aggregate. This collective data helps us determine how much our customers use parts of the site, so we can improve our site to assure that it is as appealing as we can make it for as many of you as possible. DougWebb.us & DougWebbJazz.com takes all reasonable steps to protect the privacy of its users. When you browse our website, you do so anonymously. 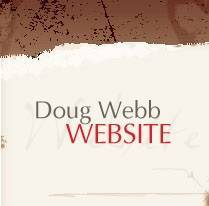 DougWebb.us & DougWebbJazz.com may record information about your website visit, such as Internet domain and host names; Internet protocol (IP) addresses; browser software and operating system types; clickstream patterns; and dates and times that our website is accessed. We do not link your IP address to any Personal Information, unless you have logged into our website. Does this Privacy Statement extend beyond DougWebb.us & DougWebbJazz.com to external links? We do not use or disclose information about your individual visits to DougWebb.us & DougWebbJazz.com or information that you may give us, such as your name, address, email address or telephone number, to any outside companies unless disclosure is required by law.